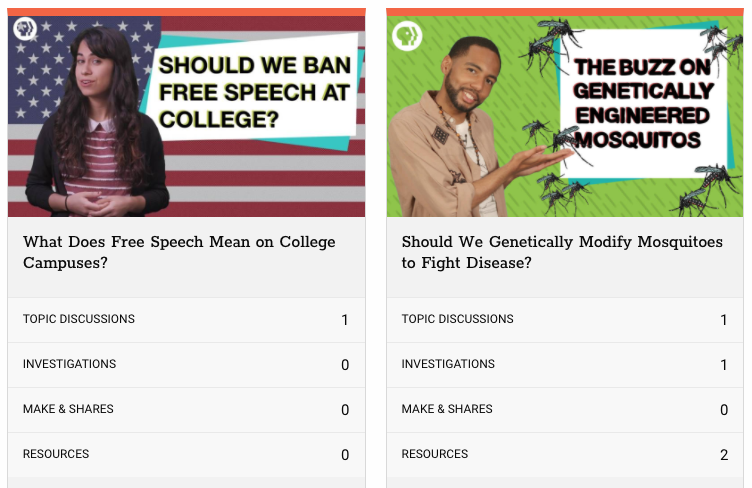 I’m excited to share the news about KQED Learn, a free, safe online space for students to engage in thoughtful discussions about timely societal topics, using fact-based arguments and social media that they share. As the next generation of KQED’s awesome “Do Now” series, this looks like a great tool for teachers to facilitate thoughtful debates with each other and youth from around the country. KQED Learn is a flexible online collaborative space for inquiry-based learning. A hub for student voices, a launching pad for exploration, and a showcase for student-made media, KQED Learn inspires students to research, reflect and respond to timely issues. Using real world topics from KQED’s video series Above the Noise, teachers can use this platform across the curriculum for everything from simple assignments to complex, collaborative inquiries. KQED Learn welcomes and amplifies student voice and inspires teacher creativity. KQED Learn provides standards-aligned media content you can use in your classroom to engage students in asking and answering important questions. KQED Learn is free for schools and students. It’s a safe environment that protects student and teacher privacy. It’s flexible by design, so teachers can use it to enrich their curriculum and fulfill instructional needs. KQED Learn is developed by educators and leverages KQED’s reputation for trusted, quality media resources.